Tesla’s commitment to new technology is what put it on the map, but the way this tech rolls out is always contentious. 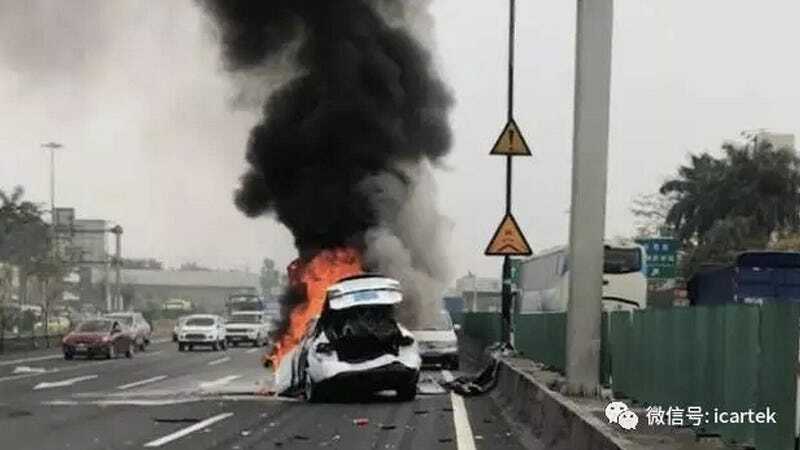 Lithium-ion batteries, Autopilot and now the Model X’s Falcon doors, which are blamed for a harrowing incident in China. In February, Lee Tada and her boyfriend were being driven by her chauffeur in the back of her Model X when they crashed into a guardrail, spun 180 degrees and were hit by another car head on, as she posted on WeChat this weekend, picked up and reported on by Electrek. Lee and her boyfriend heard the car’s battery cells exploding beneath them, but they couldn’t open the X’s rear Falcon wing doors, stuck shut. They escaped through the front, just moments before the car caught fire. Lee says that she was in a state of shock at the time and that her boyfriend had to help pull her out of the car. Here is the dramatic video of the fire, posted Sunday by Electrek and showing Lee’s face bloody from what she says is a broken nose. By her own account, she had it easy; her driver, she claims, was hospitalized for more than a month after his airbag didn’t deploy. “We are glad our customer and their passengers are safe. Working closely with authorities to facilitate their report, we have found that the debris field and damage observed indicate a very high speed collision, which can result in fire damage to any kind of vehicle, not just electric vehicles. Tesla has a sometimes defensive relationship with owners making claims about its cars getting into crashes. I don’t know how many times someone has found their Model Whatever crashed through a wall and blamed Autopilot, rather than just getting their accelerator and brake pedals confused. Tesla works hard to discredit these claims. 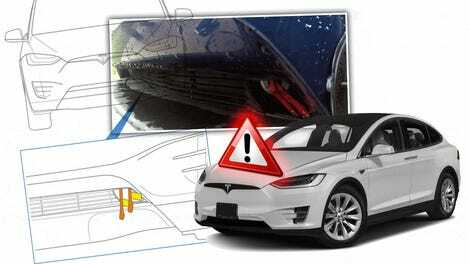 The crashes that Tesla fights with its owners tend to be he said/she said arguments, with the owners having their personal experience and Tesla having a monopoly on the data logs recorded by their cars themselves. But this fire feels like more of a responsibility question. The Falcon doors on the Model X do have an emergency release for situations like the one Lee found herself in. There’s a manual pull hidden behind the speaker grill down by your knees for opening the electrically-operated vertical doors in the case that there’s no power. This is detailed in the owner’s manual in the car itself. I won’t try to assign blame or responsibility in this case, whether or not Tesla made it insufficiently clear on how to open these doors when the car has no power, of if Lee was insufficiently responsible for learning how to act in an emergency with the car she’d only had for three months before the crash. But it feels like this keeps happening somehow. With each technology Tesla brings to the market, it seems like it ends up with a fight on its hands. UPDATE: Tesla confirmed to Jalopnik that Lee has demanded eight million yuan (about $1.1 million) from Tesla and that Tesla has no intention of paying.